I live on Vancouver Island, Canada, and would like to show you how someone (Wendy Huntbatch) was able to make a difference for many neglected or abandoned parrots by founding the "World Parrot Rescue" - it is located 10 minutes from my home. It originally started out in the Vancouver area, but was moved to rural Vancouver Island when the threat of Avian flu became an issue. The Refuge has over 800 parrots, a dedicated team of staff and volunteers, and 23,000 square feet of heated indoor free-flight aviaries with plans for 16,000 square feet of easily accessed outdoor flights for the warmer months. The Refuge opened to the public for educational purposes on June 11, 2005. Thanks for sharing that, Van; very inspirational! The future is up in the air for several hundred parrots living at the World Parrot Refuge in Coombs. Sad news to report with regard to this Parrot Refuge which I first posted about here four years ago. The founder/owner died in February and the refuge has had to close. Below are links to a couple of stories and videos about the sad situation the Refuge and the birds are now left in. This story and local TV news coverage: Rush on to find homes for 450 parrots from Coombs Refuge is from June 2. This is such a sad story. 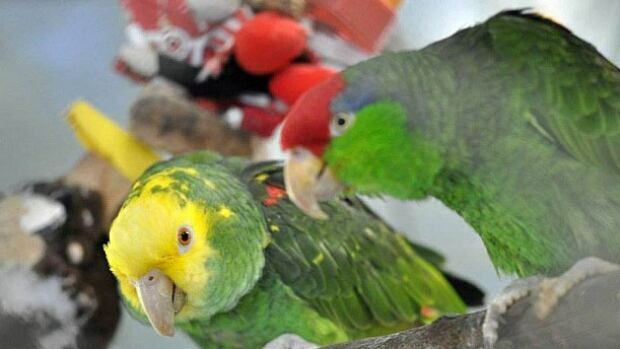 Read more about it here: Once loved, forgotten parrots face uncertain future - Vancouver Island group now struggling to find homes for hundreds of twice-orphaned birds. This story was on national CBC news today. This just breaks my heart. I almost visited the refuge when I was in the area, but could not get there and back before our ship left. How sad for all these birds. It is heartbreaking, RB. Just so sad that things came to this, after such well-meaning intentions on the part of Wendy, the founder. Here is another story dated today. Those birds are in terrible shape...most are plucked and totally stressed. I read that several hundred birds vanished as the number went from 800 to 500 plus. They are never going to find homes for these birds. They will probably be euthanized...so very very sad. These birds are very emotional and imagine what they are feeling now. It just makes me sick. I wish I had the resources to do something but I do not. I pray that there will be a favorable resolution for these birds, but I am afraid it probably will not be the case. So very sad for all these birds that need a forever home.